MASTER: "It is true that one or two can get rid of the 'I' through samādhi; but these cases are very rare. You may indulge in thousands of reasonings, but still the 'I' comes back. You may cut the peepal-tree to the very root today, but you will notice a sprout springing up tomorrow. Therefore if the 'I' must remain, let the rascal remain as the 'servant I'. As long as you live, you should say, 'O God, Thou art the Master and I am Thy servant.' The 'I' that feels, 'I am the servant of God, I am His devotee' does not injure one. Sweet things cause acidity of the stomach, no doubt, but sugar candy is an exception. "The path of knowledge is very difficult. One cannot obtain Knowledge unless one gets rid of the feeling that one is the body. In the Kaliyuga the life of man is centred on food. He cannot get rid of the feeling that he is the body and the ego. Therefore the path of devotion is prescribed for this cycle. This is an easy path. You will attain God if you sing His name and glories and pray to Him with a longing heart. There is not the least doubt about it. "Suppose you draw a line on the surface of water with a bamboo stick. The water appears to be divided into two parts; but the line doesn't remain for any length of time. The 'servant I'or the 'devotee I' or the 'child I' is only a line drawn with the ego and is not real". The "ego of a devotee"
harm in the 'servant I'?" MASTER: "The 'servant I'-that is, the feeling, 'I am the servant of God, I am the devotee of God'-does not injure one. On the contrary, it helps one to realize God." VIJAY: "Well, sir, what becomes of the lust, anger, and other passions of one who keeps the 'servant I'?" MASTER: "If a man truly feels like that, then he has only the semblance of lust, anger, and the like. If, after attaining God, he looks on himself as the servant or the devotee of God, then he cannot injure anyone. By touching the philosopher's stone a sword is turned into gold. It keeps the appearance of a sword but cannot injure. "When the dry branch of a coconut palm drops to the ground, it leaves only a mark on the trunk indicating that once there was a branch at that place. In like manner, he who has attained God keeps only an appearance of ego; there remains in him only a semblance of anger and lust. He becomes like a child. A child has no attachment to the three gunas-sattva, rajas, and tamas. He becomes as quickly detached from a thing as he becomes attached to it. You can cajole him out of a cloth worth five rupees with a doll worth an ānnā, though at first he may say with great determination: 'No, I won't give it to you. My daddy bought it for me.' Again, all persons are the same to a child. He has no feeling of high and low in regard to persons. So he doesn't discriminate about caste. If his mother tells him that a particular man should be regarded as an elder brother, the child will eat from the same plate with him, though the man may belong to the low caste of a blacksmith. The child doesn't know hate, or what is holy or unholy. "Even after attaining samādhi, some retain the 'servant ego' or the 'devotee ego'. The bhakta keeps this 'I-consciousness'. He says, 'O God, Thou art the Master and I am Thy servant; Thou art the Lord and I am Thy devotee.' He feels that way even after the realization of God. His 'I' is not completely effaced. Again, by constantly practising this kind of 'I-consciousness', one ultimately attains God. This is called bhaktiyoga. "One can attain the Knowledge of Brahman, too, by following the path of bhakti. God is all-powerful. He may give His devotee Brahmajnāna also, if He so wills. But the devotee generally doesn't seek the Knowledge of the Absolute. He would rather have the consciousness that God is the Master and he the servant, or that God is the Divine Mother and he the child." VIJAY: "But those who discriminate according to the Vedanta philosophy also realize Him in the end, don't they?" MASTER: "Yes, one may reach Him by following the path of discrimination too: that is called Jnanayoga. But it is an extremely difficult path. I have told you already of the seven planes of consciousness. On reaching the seventh plane the mind goes into samādhi. If a man acquires the firm knowledge that Brahman alone is real and the world illusory, then his mind merges in samādhi. But in the Kaliyuga the life of a man depends entirely on food. How can he have the consciousness that Brahman alone is real and the world illusory? In the Kaliyuga it is difficult to have the feeling, 'I am not the body, I am not the mind, I am not the twenty-four cosmic principles; I am beyond pleasure and pain, I am above disease and grief, old age and death.' However you may reason and argue, the feeling that the body is identical with the soul will somehow crop up from an unexpected quarter. You may cut a peepal-tree to the ground and think it is dead to its very root, but the next morning you will find a new sprout shooting up from the dead stump. One cannot get rid of this identification with the body; therefore the path of bhakti is best for the people of the Kaliyuga. It is an easy path. "And, 'I don't want to become sugar; I want to eat it.' I never feel like saying, 'I am Brahman.' I say, 'Thou art my Lord and I am Thy servant.' It is better to make the mind go up and down between the fifth and sixth planes, like a boat racing between two points. I don't want to go beyond the sixth plane and keep my mind a long time in the seventh. My desire is to sing the name and glories of God. It is very good to look on God as the Master and oneself as His servant. Further, you see, people speak of the waves as belonging to the Ganges; but no one says that the Ganges belongs to the waves. The feeling, 'I am He', is not wholesome. A man who entertains such an idea, while looking on his body as the Self, causes himself great harm. He cannot go forward in spiritual life; he drags himself down. He deceives himself as well as others. He cannot understand his own state of mind. "But it isn't any and every kind of bhakti that enables one to realize God. 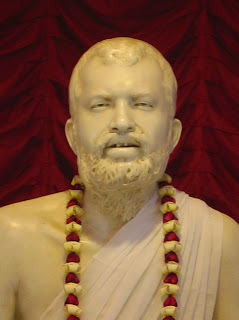 One cannot realize God without prema-bhakti. Another name for prema-bhakti is raga-bhakti. God cannot be realized without love and longing. Unless one has learnt to love God, one cannot realize Him. "There is another kind of bhakti, known as vaidhi-bhakti, according to which one must repeat the name of God a fixed number of times, fast, make pilgrimages, worship God with prescribed offerings, make so many sacrifices, and so forth and so on. By continuing such practices a long time one gradually acquires raga-bhakti. God cannot be realized until one has raga-bhakti. One must love God. In order to realize God one must be completely free from worldliness and direct all of one's mind to Him. "But some acquire raga-bhakti directly. It is innate in them. They have it from their very childhood. Even at an early age they weep for God. An instance of such bhakti is to be found in Prahlada. Vaidhi-bhakti is like moving a fan to make a breeze. One needs the fan to make the breeze. Similarly, one practises japa, austerity, and fasting, in order to acquire love of God. But the fan is set aside when the southern breeze blows of itself. Such actions as japa and austerity drop away when one spontaneously feels love and attachment for God. Who, indeed, will perform the ceremonies enjoined in the scriptures, when mad with love of God? "Devotion to God may be said to be 'green' so long as it doesn't grow into love of God; but it becomes 'ripe' when it has grown into such love. "A man with 'green' bhakti cannot assimilate spiritual talk and instruction; but one with 'ripe' bhakti can. The image that falls on a photographic plate covered with black film5 is retained. On the other hand, thousands of images may be reflected on a bare piece of glass, but not one of them is retained. As the object moves away, the glass becomes the same as it was before. One cannot assimilate spiritual instruction unless one has already developed love of God." VIJAY: "Is bhakti alone sufficient for the attainment of God, for His vision?" MASTER: "Yes, one can see God through bhakti alone. But it must be 'ripe' bhakti, prema-bhakti and raga-bhakti. When one has that bhakti, one loves God even as the mother loves the child, the child the mother, or the wife the husband. "When one has such love and attachment for God, one doesn't feel the attraction of maya to wife, children, relatives, and friends. One retains only compassion for them. To such a man the world appears a strange land, a place where he has merely to perform his duties. It is like a man's having his real home in the country, but coming to Calcutta for work; he has to rent a house in Calcutta for the sake of his duties. When one develops love of God, one completely gets rid of one's attachment to the world and worldly wisdom. However much one may perform worship and sacrifice? "If the devotee but once feels this attachment and ecstatic love for God, this mature devotion and longing, then he sees God in both His aspects, with form and without form." VIJAY: "How can one see God?" MASTER: "One cannot see God without purity of heart. Through attachment to 'woman and gold' the mind has become stained-covered with dirt, as it were. A magnet cannot attract a needle if the needle is covered with mud. Wash away the mud and the magnet will draw it. Likewise, the dirt of the mind can be washed away with the tears of our eyes. This stain is removed if one sheds tears of repentance and says, 'O God, I shall never again do such a thing.' Thereupon God, who is like the magnet, draws to Himself the mind, which is like the needle. 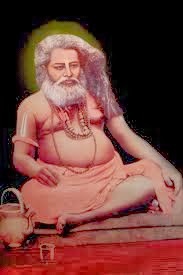 Then the devotee goes into samādhi and obtains the vision of God. "God doesn't easily appear in the heart of a man who feels himself to be his own master. But God can be seen the moment His grace descends. He is the Sun of Knowledge. One single ray of His has illumined the world with the light of knowledge. That is how we are able to see one another and acquire varied knowledge. One can see God only if He turns His light toward His own face. Behold the face of the Mother, Brahman's Embodiment." As Vijay had brought medicine with him, the Master asked a devotee to give him some water. He was indeed a fountain of infinite compassion. He had arranged for Vijay's boat fare, since the latter was too poor to pay it. Vijay, Balaram, M., and the other devotees left for Calcutta in a country boat.